It gets to a certain point and stops moving and I see no physical binding. Thanks Jesse. There's a worm gear on the motor shaft that drives the gear which in turn drives the knob shaft. One or both are damaged. These are inside a small metal box attached to the motor. This is your pre, see the metal box between the motor and face? Inside are the gears. Can you turn it all the way by hand? In that case, I'm 99% sure you have a stripped/broken gear. 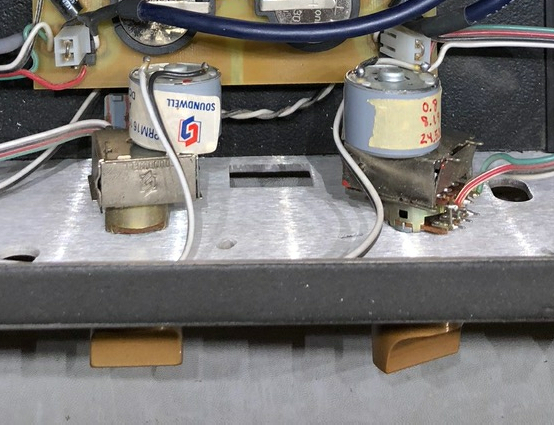 I switched the Valvo Hamburg 12ax7 back to the Raytheon 5751 yesterday, and, today when I fired up the tunes it was like flipping a switch with the gain. I'm hearing gain like I would expect. The sound is starting to open up and I'm really liking what I'm hearing. I've read about many owners trying the 12ax7's, nobody really liked them all that much. Judd himself said that they have tried every compatible nos tube in his circuit, and the ones that came with the Joule's and that he recommends, are the best to his ears. Every NOS, that's a lot of tubes! Not at all doubting the 12AX7 doesn't seem to be a good fit, but that's a LOT of tubes if he means "every" NOS 12AX7/ECC83. Just the Euro variations are staggering. Must have been several years of development just to test every tube in the circuit. That's dedication, for sure. Oh, that's just great...start a war with the mob! and nut in the same post apparently. LMAO....I know Brock, I can take it as well as dish it out. Want to hear more from the man about the Joule. C'mon Kerry, we don't care if you have to type in your underwear. Maybe Ryan does, rainbow colored stuff and all. Any additional thoughts regarding the modification, Kerry? I have an incredibly deep stage. The sound was good before so it's not a monumental improvement in most areas, but, the stage has increased everywhere slightly. The depth was a monumental improvement. Still fleshing out the rest of it. Noticing improvement in individual instrument and vocal separation. The first thing I noticed was bass detail. It has become more detailed and articulate. That still impresses me. Kerry, would you say it's retained it's musicality after the upgrades ? Any updates ? How she breaking in ? Haven't had much listening time lately due to work. I'm not sure I could say it's even broke in yet. I'm liking what I'm hearing so far.